Aurumage Casino Review - Is this Bitcoin Casino Safe or Scam? Active since 2003 and now offering provisions for bitcoin bettors, Aurum Age Casino covers all the main bases when it comes to games and options. Although there might be a few holes in its proverbial game, this operator has a few clever tricks up its sleeve that should appeal to savvy players. To find out what all this means in reality, stick with us for the next few minutes as we review AurumAge.com. There’s a saying in life that goes “all that glitters is not gold” and this couldn’t be more apt for Aurum Age Casino. For those that don’t know, Aurum is Latin for gold, but if we’re being honest that’s about the only thing that is golden about this casino’s interface. Of course, if you’re a fan of bitcoin casinos that look like they were made in the late nineties, Aurum Age Casino is the place to be. However, in an age of dynamic interfaces, auto-loading page elements and fancy animations, it’s a safe bet the overall look won’t pique your interests. But, and this is a big but, this site is actually a shining example of the “all that glitters is not gold” phrase but in reverse. While there are plenty of online bitcoin casinos that look great, many of them don’t really have the backbone to back it up. In contrast, Aurum Age Casino isn’t that great to look at, but it does have some great reasons to ante-up. The first thing to note is that moving from game-to-game is actually quite easy. Although the menu on the left of the page doesn’t have the style that you might expect from some sites, it is effective. Click on a link and a page loads with the relevant information: genius! OK, so maybe it isn’t genius, but it doesn’t need to be. In fact, what a number of online casinos seem to do these days is overcomplicate things that don’t need to be overcomplicated. If you look at Aurum Age Casino from this perspective, it’s actually quite a refreshing place to play. Indeed, this idea of “no nonsense” navigation continues when you load up a game page. At the top you’ll find a heading with an associated image. From this you simply roll your mouse pointer down a list, stop at the option that takes your fancy and click “for money” or “for fun”. Both options open a new boxout that loads a Flash game where, again, simplicity is the order of the day. 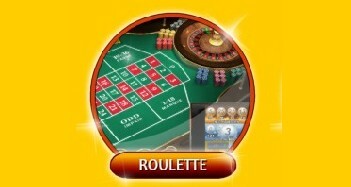 Because Aurum Age Casino appears to have developed all of its games in-house, the range of options is certainly unique. However, you won’t find yourself swimming in additional features. For example, at the latest bitcoin casinos you’ll find in-game info tabs that run through recent results, statistical trends and your betting history. At Aurum Age Casino you don’t really get any of that. However, it’s also fair to point out that you don’t get that inside a bricks and mortar casino either, so maybe that doesn’t really matter. To sum up the overall design of AurumAge.com, it’s not great. However, if you’re willing to look beyond its looks and concentrate on the actual process of playing, there is some real value to what the developers have put together. When the chips are down, all that really matter is the games on offer and how you find them. This platform makes the process as direct, if a little visually uninspiring, as possible. Now, it’s at this point in our Aurum Age Casino review that we’re at a slight loss for words. Unlike its peers, this bitcoin casino site doesn’t anything in the way of rewards or bonuses. There is, if you click around, a page labelled “achievements” which seems to suggest you can get something extra for your time online. Five Days Playing: Play any real money casino game for five days in a row and get….? Zero Hunter: Hit the number zero five times during a session of roulette and win….? Blackjack Trapper: Make blackjack five times in a session to win…? Happy Leprechaun: Get five prizes in the Golden Leprechauns slot game to win….? 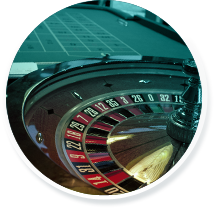 OK, whether there is or isn’t a bonus system, there is an affiliate program where you can receive 15% of a referral’s casino profits which equates to 3% of their lost bets. In reality, this doesn’t really make up for the lack of real bonuses, but at least it’s something. In terms of quantity, AurumAge.com can’t really compete with the industry’s top players. Although the roster of 68 games does cover the main gaming categories (as you’ll see below), the number of options is markedly less than many other sites. Having said this, if you value exclusivity and interaction, then Aurum Age might just tickle your fancy. Yes, there aren’t many games to choose from and yes the software isn’t overly complex, but you will get to play slots and table games you won’t find anywhere else. As we’ve said, an in-house design team is responsible for the games you get to play and this ensures the flow of action is unlike any you’ll find elsewhere online. Aside from offering a unique selection of slots and casino games, Aurum Age also gives you the chance to play at multiplayer tables. 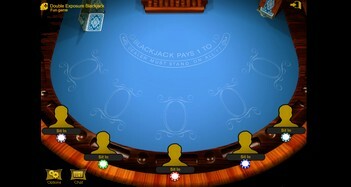 As we’ve noted above, blackjack, roulette, baccarat and poker can be played alongside other players and made more entertaining thanks to the on-table chat option. When it comes to licensing and provability credentials, Aurum Age Casino doesn’t give much away. However, what we do know is that the site’s software is secure. Aside from employing SSL encryption and bearing a certificate that says its “Hacker Safe”, this operator allows you to make deposits with a variety of well established processors. Although you won’t actually be playing in BTC/mBTC amounts at the table (everything is in USD), you can make bitcoin deposits. Additionally, if you’re looking to try a different cryptocurrency, Aurum Age Casino also accepts Litecoin, Dogecoin and Dash. Moreover, you can also use BTC-e voucher codes to send money to your account. Assuming you choose bitcoin as your preferred currency, all you have to do is input the USD amount you want to deposit and click “continue”. At this point the software will direct you to a Paymentbar page where you can either scan a QR code using your smartphone or copy the wallet address. 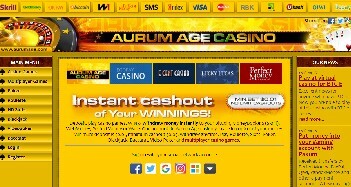 After following these simple steps, Aurum Age Casino will process your transaction immediately and without any fees. While the deposit process is in line with industry standards, Aurum Age does have the edge over virtually every other site when it comes to withdrawals. Unlike other bitcoin casinos that ask you to upload documents (to prove your identity) and then subject each cashout request to an internal processing period, Aurum does everything instantly. Regardless of the amount you want to withdraw, this operator will give you your cash within seconds and, what’s more, you won’t have to pay for it. This is certainly a bold move on the casino’s part, but it’s certainly a positive that many players will appreciate. The final feature worth pointing out is the sign-up process. Here, as with deposits and cashouts, speed is the key. Just as Aurum can lay claim to offering the fastest withdrawal process in the industry, it also has one of the slickest sign-up procedures. If you want to do things the traditional way, an email address, username and password are all you need to get going. In fact, to make these slightly easier, Aurum will even suggest usernames and passwords for you. However, if you want to be a bit different, you can sign-up using a social media account. In the same way that mobile apps can connect with your Facebook, Twitter or Google+ account to register your details, Aurum Age Casino can do the same. This basically means you can click a button, hit confirm and you’ll have an account in seconds. This, for a site that looks slightly dated, is a great use of modern technology. In fact, when you combine its unique selection of games with a clever use of speed (i.e. for sign-ups and withdrawals), the site starts to look a lot more attractive. Will it ever be considered the best bitcoin casino in the world? Probably not, but it’s certainly a solid alternative to some of the industry’s major players if you’re looking for a change.